As a College of Education student, Lauren Slenker ’17 learned the importance of fostering relationships. She’ll bring those lessons to her own middle grades classroom this fall. 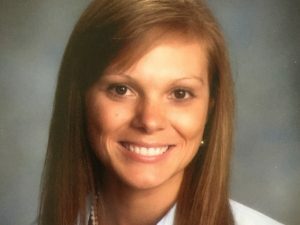 Activities: Volunteer at SPCA of Wake County, Child Sponsor through Food for the Hungry, Wolfpack Writing Project at Centennial Middle School, Kappa Delta Pi Honor society, Recipient of the Golden Apple Future Teacher Award from Education Council, 2017 Student Teacher of the Year Nominee. What I’ve Learned That Will Stay With Me: Fostering relationships with others is one of the most important tasks a person can take on. Building relationships with your students and their parents will positively impact the way your students respond and respect you. Keeping in contact with mentors, professors prior administration, etc., offers an outlet to gain advice and an experienced ear to answer questions. Building a positive relationship with your coworkers will allow for a positive work environment and opportunities for collaboration. How the College Changed Me: This experience has made me not only smarter but wiser. It has taught me that teaching isn’t just about the curriculum; it is about fostering relationships with students and colleagues, creating a safe learning environment, and having fun while learning. My Favorite College of Education Memory: The day Dr. Candy Beal [associate professor of middle grades social studies education] took the class aboard the Raleigh Trolley. This trip taught me to look into different types of field trips for my students and to look at teaching from different angles. This type of experience would make a lasting impression on a student’s life, more than simply researching and discussing Raleigh’s history in class. Why Others Should Teach, Too: Becoming a teacher means being a inspiration and getting to mentor adolescents. Not many professions offer the opportunity to touch thousands of lives, and it is impossible to tell where your influence stops. Your students will look up to you more than you know, and they will remember you when it’s time for them to move on. Yes, teaching can be one of the most demanding careers, both physically and mentally; however it is also the most rewarding.